Greece’s most successful and longest-serving National Soccer Team coach Otto Rehhagel has agreed to extend his contract and try to lead the side to the 2010 World Cup in South Africa. The Greek Soccer Federation announced the news in a written statement on Saturday after its President, Vassilis Gagatsis, held talks with the 69-year-old German who guided Greece to their unlikely Euro 2004 victory four years ago. No further details of Rehhagel’s contract were made public. The German has been with Greece since September 2001 when his first game was a 5-1 home defeat to Finland. However, Rehhagel’s impact was evident just one month later when Greece almost scuppered England’s plans for qualifying for the 2002 World Cup by holding them to a 2-2 draw at Old Trafford. Rehhagel then led the Greek team to just the second European Championships in its history, before shocking the world of soccer by making it to the final of Euro 2004 and beating hosts Portugal 1-0 in the final. Greece reached the upcoming Euro 2008 tournament as group winners. In total, Rehhagel has been at Greece’s helm for 78 games, winning 43, drawing 16 and losing 19. Posted by grhomeboy in Basketball. 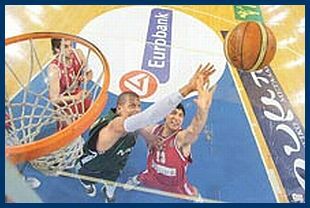 Panathinaikos forward Mike Batiste (left) and Olympiakos’s Panayiotis Vassilopoulos battle under the net in last night’s tense cup final. Panathinaikos held on for an 81-79 win over Olympiakos in the basketball cup final last night, a triumph that kept the Athens basketball club on track for a fourth consecutive league-and-cup double. The victory over archrival Olympiakos, the third in as many encounters between the two clubs this season, came as consolation for Panathinaikos following last week’s shock exit from the Euroleague’s Round of 16 after the Greek club was crowned European Champion a season earlier. Olympiakos has not won a title in any competition since 2002. Strict security measures were implemented for last night’s cup final, with a total of just 1,700 fans of both clubs seated well apart in the 10,000-capacity Hellenikon Stadium in southern Athens. Olympiakos never led in the game, which started tightly with emphasis on defensive play, but the Piraeus team clawed its way back to temporarily level late in the game. The defending champions gradually built momentum for a commanding 63-50 lead at the start of the fourth quarter with a three-point shot from power forward Costas Tsatsaris, a valuable return from injury who was voted the final’s MVP. But Olympiakos then gradually narrowed the gap to trail by five points, 67-62, with five minutes remaining. Center Yiannis Bourousis leveled, 78-78, with 14.9 seconds left on the clock. Panathinaikos playmaker Sarunas Jasikevicius, fouled with 12 seconds to go, was on target with both his free throws to put Panathinaikos ahead 80-78. With 5.7 seconds left, Lynn Greer netted one of two free throws for an 80-79 deficit, which his team failed to overcome in the last few seconds of play. Greece has traveled to Germany for a friendly match against Portugal in Dusseldorf tonight without key central defender Traianos Dellas. Coach Otto Rehhagel has not called up a replacement for Dellas on the experienced squad he has chosen following experiments in recent friendlies against the Czech Republic and Finland. OFI goalkeeper Alexis Tsorvas, an impressive performer this season, is the only new face on the Greek squad. Rehhagel is expected to decide later this week whether he will remain with Greece for the 2010 World Cup qualifiers. His current contract ends after Euro 2008. Posted by grhomeboy in Aquatics. Yiannis Drymonakos (l) added a fourth medal (silver in the men’s 400 m medley) to Greece’s tally at the Europeans on Monday night. The Greek National Team’s showing at the European Swimming Championships, which ended Monday night, proved successful yet paradoxical should performance be measured in numbers alone. Greek swimmers struck gold for the first time ever at European-level competition, twice for that matter, and also raked in two silver medals. 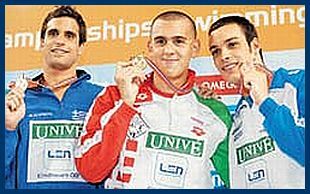 All four medals were won by two swimmers, Yiannis Drymonakos and Aris Grigoriadis, who each won a gold and silver medal. But the number of Greeks who qualified for finals fell again, as has invariably been the case in recent years. There were a total of seven Greek entries in finals at the Eindhoven, the Netherlands, event. Two years earlier in Madrid, where the level of competition was lower, Greece’s finalist tally reached 13. Even so, the National Team had never won a gold medal since the Europeans were launched in 1926. But this was accomplished twice in Eindhoven. Yiannis Drymonakos won the gold medal in the men’s 200-meter butterfly with a new European record time of 1.54:16, which ranks as the second-fastest performance of all time behind Michael Phelps, the renowned American record holder. Drymonakos added a silver medal to his tally on closing night, Monday, in the men’s 400-meter medley. He set a new National record, 4.14:72. 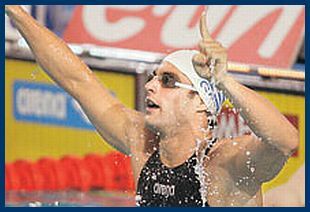 Aristidis Grigoriadis won Greece’s other gold medal in the men’s 50-meter backstroke with a time of 25.13 seconds. He also won a silver medal in the men’s 100-meter men’s backstroke. Posted by grhomeboy in Culture History Mythology, Greek Culture Heritage, Olympic Games, Sports & Games. 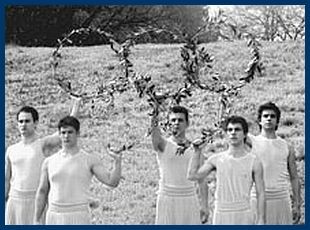 Male dancers (above) form the Olympic circles with olive branches during a rehearsal for the lighting of the flame in Ancient Olympia, where the Olympics were born in 776 BC. 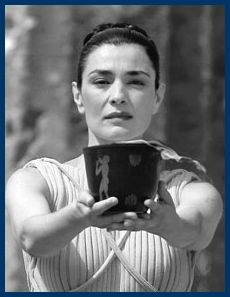 Actress Maria Nafpliotou (right), in her role as the high priestess at the actual ceremony on Monday, holds up the Olympic Flame after it was lit using the sun’s rays. Sport in ancient Athens has long been a paradox for ancient historians. The world’s first democracy may have opened up politics to everybody but it had no impact on sporting life. Athletics continued to be an exclusive pursuit of wealthy citizens. In spite of this, the vast majority of the citizens, who as poor men were very critical of the aristocracy, actually lavished time and public money on sporting competitions and facilities, esteemed elite sports stars above all other public figures and handed international victors the metaphorical keys to the city. Recent scholarship on sport and war helps us solve this baffling state of affairs. In the lead-up to the Beijing 2008 Olympic Games, we are constantly reminded of the cherished belief of the Olympic movement that international sport reconciles hostile countries and encourages world peace. As noble as this may be, a generation of scholarship has shown this belief to be almost entirely false. Sport and war – we know now – often manifest the same values and practices, such as aggressiveness and cruelty, and tend to legitimize each other. As such, the military hyperactivity of the ancient Athenian democracy gives us a clue to understanding the paradox of its sporting life. Panathenaia > The Athenians provided tens of thousands of liters of sacred olive oil and silver crowns as prizes for sportsmen at their local games of the Great Panathenaia. This was the large-scale version of the city’s annual festival in honor of its patron deity, Athena, which was staged every four years. It included over a hundred contests or bouts, not just in athletics and the athletic team event of the torch race, but also in horsemanship, music and choral singing. The people of Athens also carefully administered and renovated the city’s athletics fields and witnessed a massive expansion in the number of wrestling schools. They awarded free meals and front-row seating at their regular sporting and cultural events for life to those citizens who had won an athletic or equestrian event at one of the Panhellenic or international games, which were staged,every two or four years at Isthmia, Nemea, Delphi and, of course, Olympia. Since these were the democracy’s highest honors, their granting to athletic victors points to an extraordinarily high estimation of these stars. Such a high regard of athletes also left its mark on the irreverent comedies of the 5th century BC, in which the city’s athletes were the only group in the public eye to escape the abuse and ridicule of the comic poets. For the youths of classical Athens, training in athletics was given in the regular school classes of the athletics teacher. Isocrates explains how they instruct their pupils in “the moves devised for competition,” train them in athletics, accustom them to toil and compel them to combine each of the lessons they have learnt. According to this Athenian philosopher, all of this turns pupils into competent athletic competitors as long as they have some natural talent. Sports and learning > Often athletics teachers are represented in Athenian art as giving classes in wrestling or in the other “heavy” events of boxing and the “no holds barred” pankration, which is an unsurprising state of affairs, as many of these teachers owned wrestling schools and some had been victors in such events in their youth. Nonetheless we also find athletics teachers training their charges in the standard “track and field” events of ancient Greek athletics. Predictably the expense of buying and raising horses ensured that contestants in the chariot and horse races would always be those Aeschylus calls the “super-rich,” such as leading politicians, tyrants and Kings. More surprising is that athletics was out of reach to the vast majority of Athenians. Since the Athenian state did not finance nor administer education, each family made its own decisions about how long their sons would attend school and whether they would pursue each of the three traditional disciplines: athletics, music and letters. The Athenians understood very well that the number of educational disciplines a boy could pursue and the length of his schooling depended on the resources of his family. Money determined not only whether a family could pay the fees of the letter teacher, lyre [a musical instrument] teacher and athletics teacher but also whether they could give their sons the required leisure to pursue disciplines that were taught concurrently. Most poor citizens needed their children and wives to help out with family farming or business concerns. As a result, poor Athenian families passed over music and athletics and sent their sons only to the lessons of the letter teacher, which they believed to be the most useful for moral and practical instruction. Thus it was only wealthy boys who received instruction in each of the three disciplines of education. Without school-based training in athletics, which everyone recognized as necessary for effective competition, poor youths simply did not enter athletics contests. In the world’s first democracy, sport was only practiced by wealthy Athenians. There were other activities in classical Athens, such as the drinking party, horsemanship, pederastic homosexuality and political leadership, which were also the exclusive preserves of the wealthy. However these upper-class pursuits – in contrast to athletics – were ridiculed and heavily criticized in the debates and public conversations of the democracy. Poor Athenians may have hoped to enjoy, one day, the lifestyle of the rich, but they still had problems with their exclusive pursuits, frequently associating them with stereotypical misdeeds of this social class. Into battle > Critically, classical Athenians thought of and described athletic contests and battle with a common set of concepts and words. Most importantly, both were considered an agon or a contest decided by mutually agreed rules. Today, when even democracies sometimes wage war contrary to international law and break the Geneva Convention, it is hard to recognize that European warfare was once a highly regulated activity and viewed as an honorable way to settle disputes between states. The battles of the ancient Greeks were no exception, being conducted according to a shared set of nomoi or customs. Thus a Greek city informed another of its intention to attack by sending a herald. By agreement, their phalanxes of heavy infantrymen met on an agricultural plain. After hours of hand-to-hand fighting, the decisive moment was the trope or turning, when the hoplites of one side broke up and ran for their lives. The victors only pursued them for a short distance, as they had much left to do on the field of battle. There they collected the bodies of their dead comrades, stripped the bodies of the enemy, and used some of the weapons and armor so acquired to set up a trophaion or trophy. When the defeated had time to regroup, they sent a herald to those controlling the battlefield for a truce to collect their dead. Custom dictated that the victors could not honorably refuse this request. The citizens of classical Athens also thought battle and athletics involved the same ideals and tribulations. Both activities were recognized as involving ponoi or painful toils bring honor and kindinoi or dangers, with athletes, especially in the “heavy” events, frequently being injured, maimed or killed. They believed it was the arete or manly excellence of individual soldiers and athletes, inherited from ancestors, and the support of gods and demigods, which secured nike or victory. Victory brought fame to the city of athlete and soldier, while defeat or the refusal to compete, in either activity, was a sign of cowardice and a cause of personal shame. Although Athenian warfare, before the democracy, was a predominantly upper-class activity, the democratic revolution of the late 6th century BC subjected warfare to a profound democratization practically and ideologically. With the creation of a city-based army of hoplites, the construction of a massive war fleet, in the late 480s, and the introduction of state pay for military service, soldiering – like politics – was opened to every class of Athenian. Democracy > To fight and, if necessary, die for the city became the solemn duty of all citizens, which, in an unprecedented era of Athenian bellicosity, they did with disturbing regularity. Warfare was now the main public expenditure and business of the Athenian democracy and its martial achievements were glorified in public speech, drama and public art and architecture. Critically the egalitarianism of the democracy resulted in the traditional values of war, such as arete and ponoi, which had once been the preserve of the heroes of Homer and the aristocrats of the pre-democratic era, being recognized in the military actions of rich and poor citizens alike, whether they served as heavily armed infantrymen or sailors. This democratic ethos also saw every Athenian soldier given equal credit for the city’s military victories and – if killed in action – a sumptuous funeral and veneration as a demigod. Every Athenian soldier was now treated like Achilles or Hector. This democratization of war had a profound impact on the standing of athletics. Poor Athenians came to believe that upper-class athletes exhibited the same moral qualities and experienced the same ordeals as they did when fighting battles. This affinity of theirs with the values of sport ruled out serious criticism of sportsmen in public discourse and underwrote the exceptionally high estimation of athletics. In short, the democratic style of war in classical Athens legitimized and supported elite sport. Dr David Pritchard is an ancient historian at the University of Sydney. He will be speaking at the Australian Archaeological Institute in Athens, 2 Promachou Street, Makriyianni, Athens, on April 1 at 7 p.m. This talk is free and open to the general public. Copyright notice > Article by Dr David Pritchard for the Greek daily Kathimerini. All rights reserved. Greece’s 4×200-meter freestyle swimming team came seventh at the European Swimming Championships in the Dutch city of Eindhoven yesterday. Greece won two gold medals late on Friday night with Yiannis Drymonakos winning the 200-meter butterfly and Aris Grigoriadis coming first in the 50-meter backstroke. Greek swimmer Yiannis Drymonakos celebrates after winning the gold in the 200-meter butterfly at the European Swimming Championships in Eindhoven, the Netherlands, yesterday. Drymonakos touched in ahead of Poland’s Pawel Korzeniowski and Russia’s Nikolay Skvortsov.